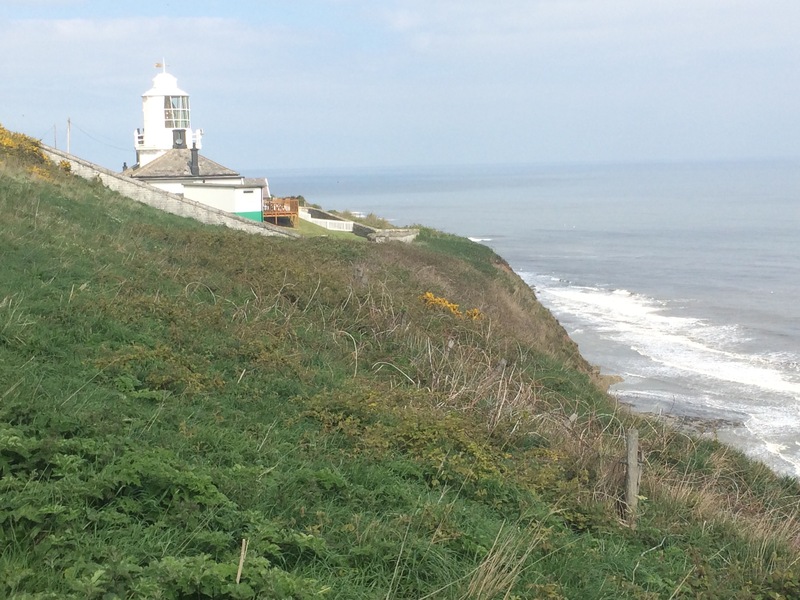 Two distinct parts of Yorkshire this week: the eroding Holderness coast with its lost villages and small seaside towns, and then the striking North Yorkshire Moors. 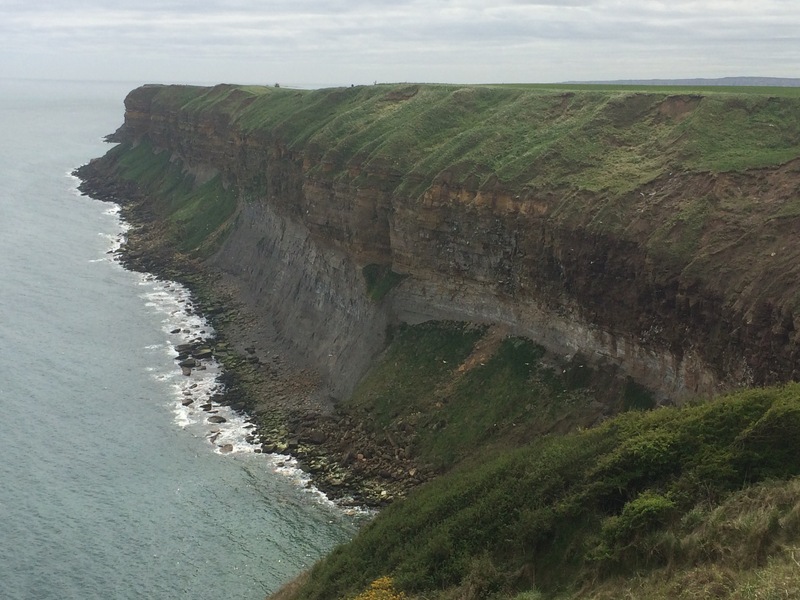 In between those was Flamborough Head and Bempton Cliffs, which were just stunning. All the sea birds were amazing to see, especially the puffins. Passing through Bridlington and Scarborough it struck me that every large town I can think of that I’ve walked through, the posh end with the large houses has been to the South and the funfairs etc at the North end of town. Just an observation. 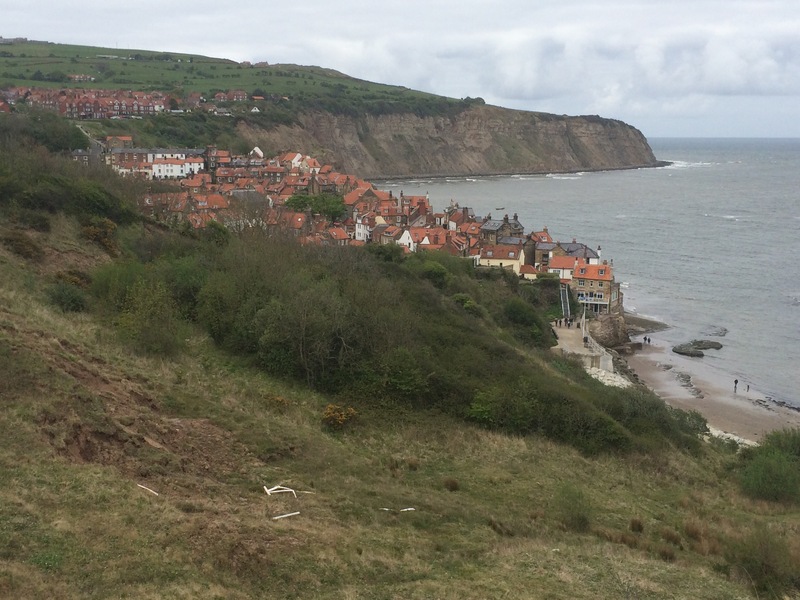 I met lots of walkers doing the Cleveland Way around N Yorkshire and then at Robin Hood’s Bay there were people finishing the Coast-to-Coast. No one going as far as me and I did upstage all the other walkers drinking in the Bay Hotel when I was asked about my walk. A bit embarrassing. 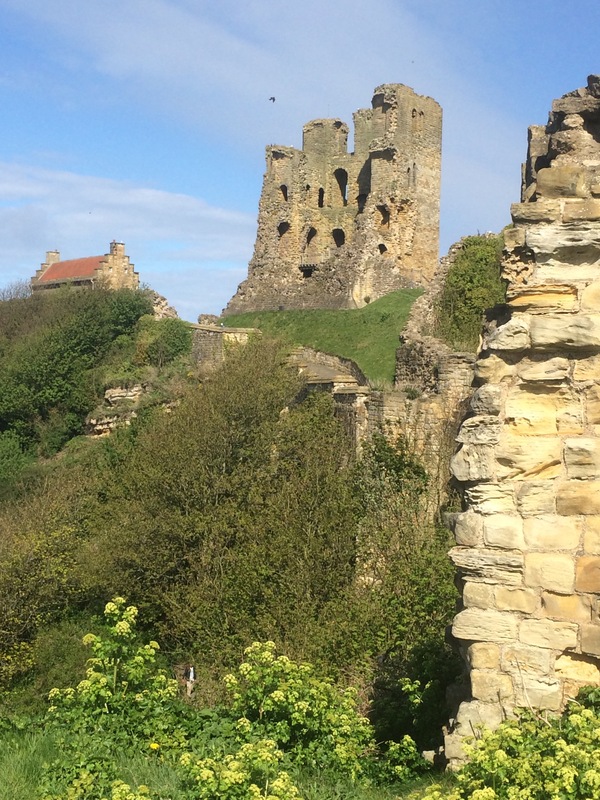 I enjoyed all the history of the North Yorkshire coast (and the lack of caravan parks). I was particularly struck by the old fishermen’s woolly jumpers called ‘ganseys’. They were knitted with patterns specific to the community the fisherman was from, which meant in the event of an accident (and there were many) the home of the body was identifiable. I hope to come back to the Yorkshire coast again; beautiful places. 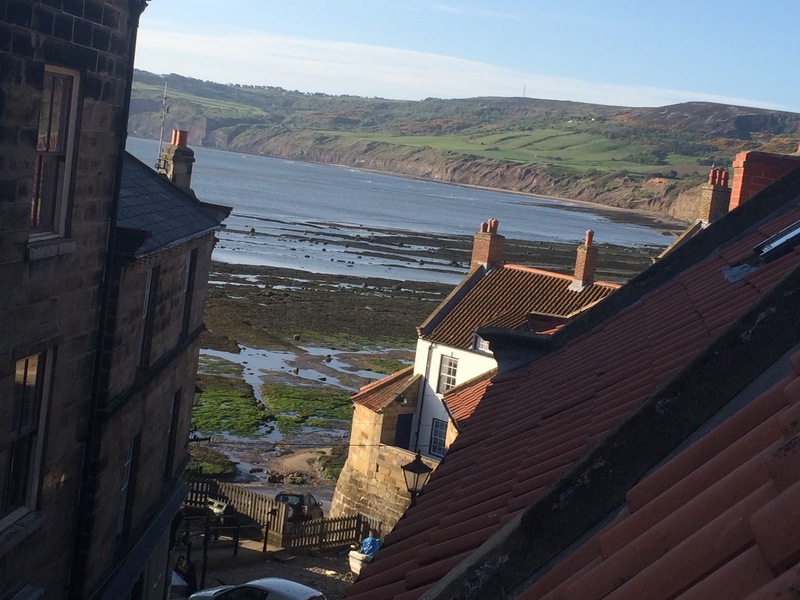 It was nice to spend a couple of days in Robin Hood’s Bay staying in one of the quirky fishermen’s cottages at the bottom of the steep hill. The weather wasn’t too bad and I was determined to go for a first dip in the sea on my trip, so Sally and I braved the cold sea twice. 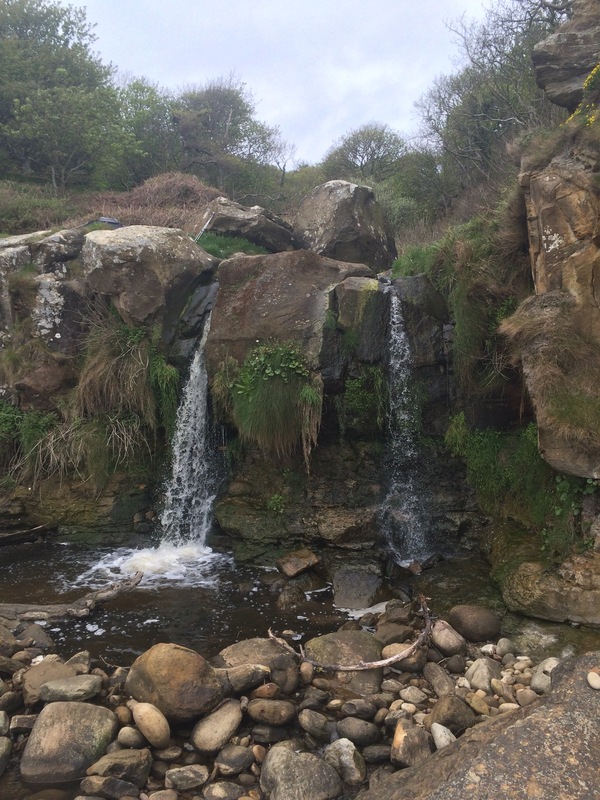 Once at Hayburn Wyke, a magical place where the beck flows onto the stony beach, and on Sunday morning in Robin Hood’s Bay before breakfast. Invigorating is the word. 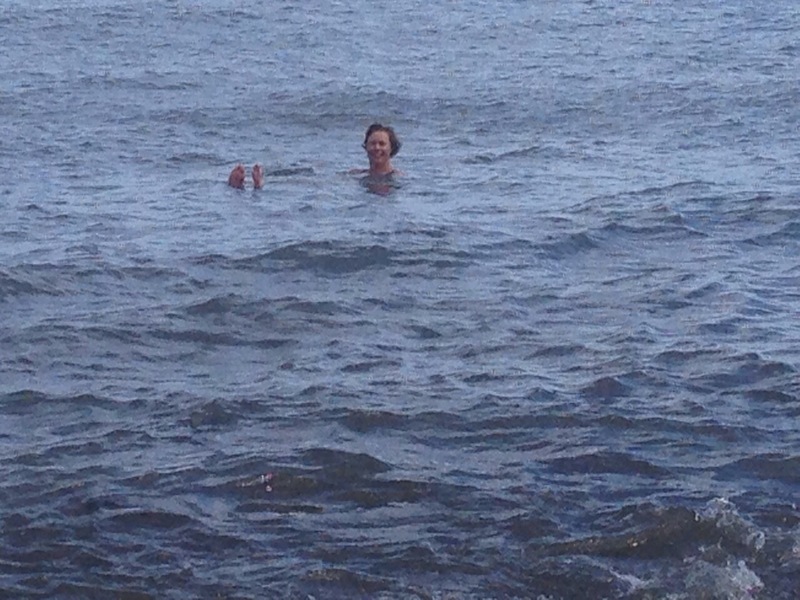 swimming (briefly) at Hayburn Wyke. Freezing! 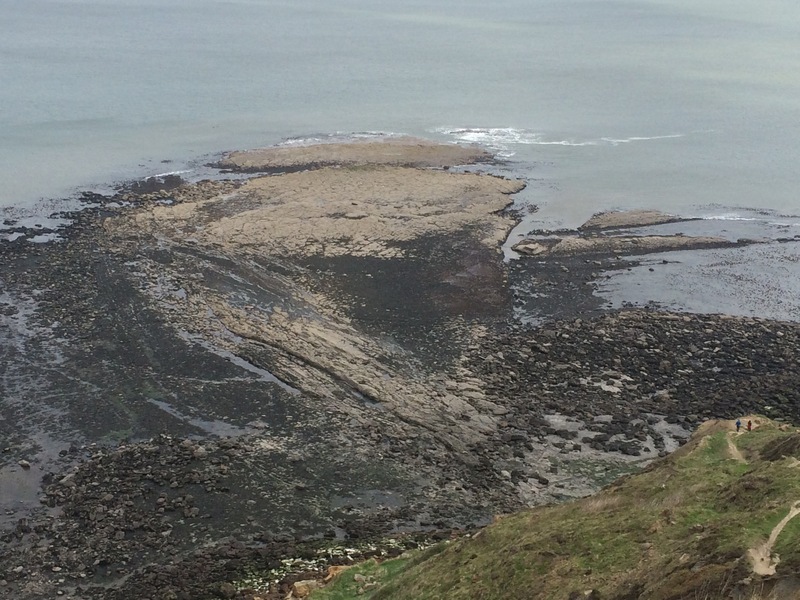 I went back to Ravenscar when the tide was out to get a good look at Peak Fault, the only fault line I know of in Britain. I thought it was impressive. It was also a chance to watch the seal colony that basks at the base of the cliff. Weather forecast is predicting rain for much of the next week as I tackle the Northern towns of Middlesbrough, Hartlepool, Sunderland and Newcastle. I am therefore expecting a big contrast to last week. An easy day today as I could leave behind my tent, cooking stuff and spare clothes and head to Whitby with a lighter rucksack. No poles required and the walking felt so easy, which is a good job because the start is a walk up the 30% gradient hill out of Robin Hood’s Bay. The tide was out so I got a good view of the ‘scaurs’ left by the erosion of ancient sandstone formations. 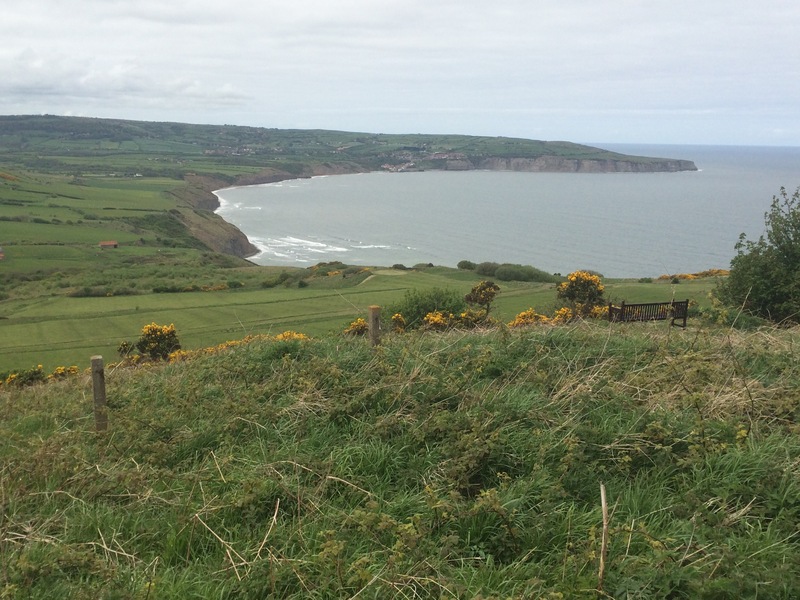 Another chance to enjoy the back drop of the North Yorkshire Moors as I walked over the cliff tops to Whitby. 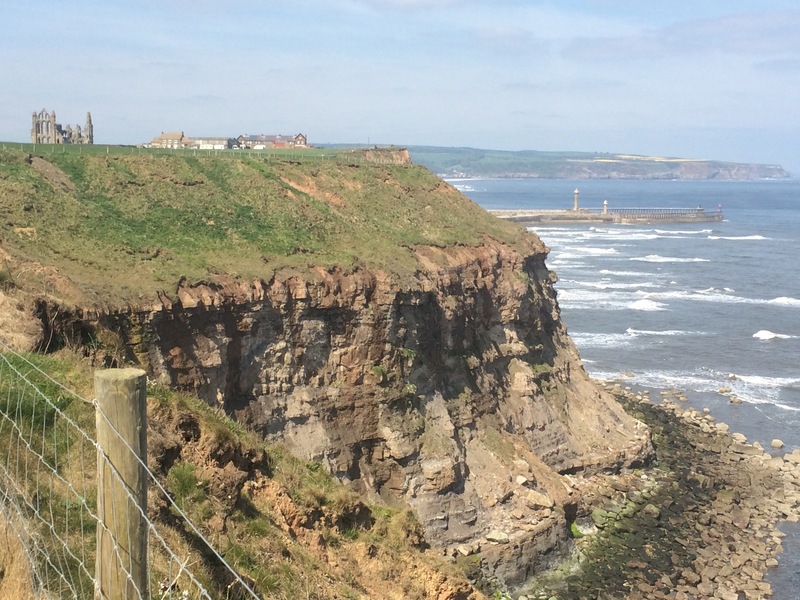 It’s easy to see where Whitby is because the old Abbey ruins stand proud on the cliff top and the harbour sea defence also juts out from behind the cliffs. 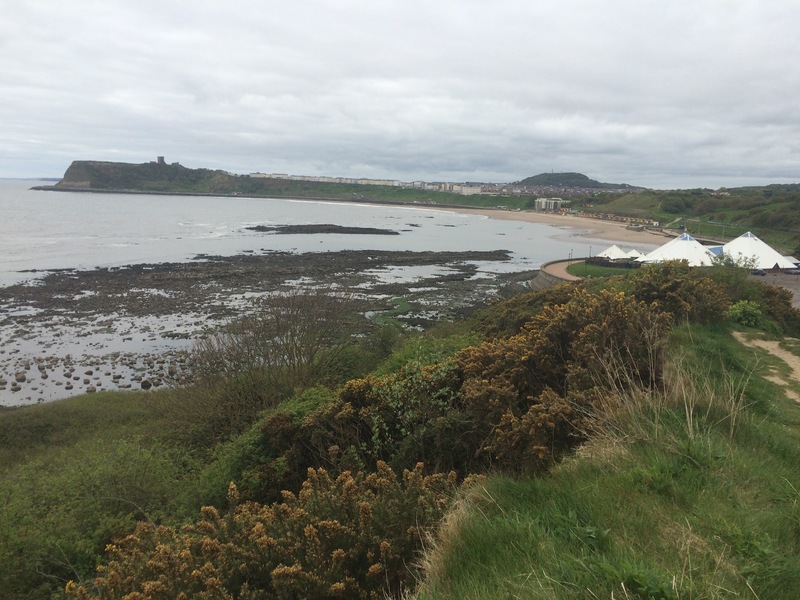 But first there’s Selwick’s Bay, a lovely stretch of beach framed by the Black Nab To the South and Saltwick Nab to the North. 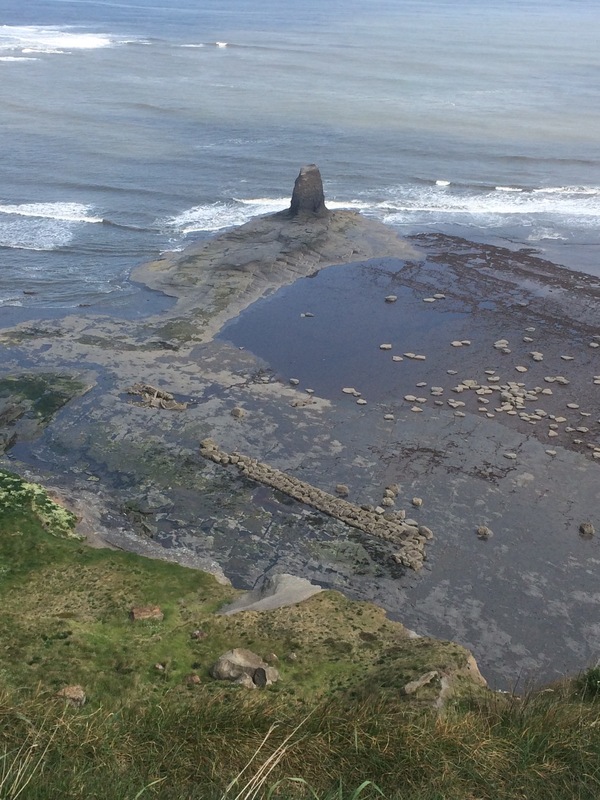 Black Nab looking a bit like a submarine…or is it a shark? 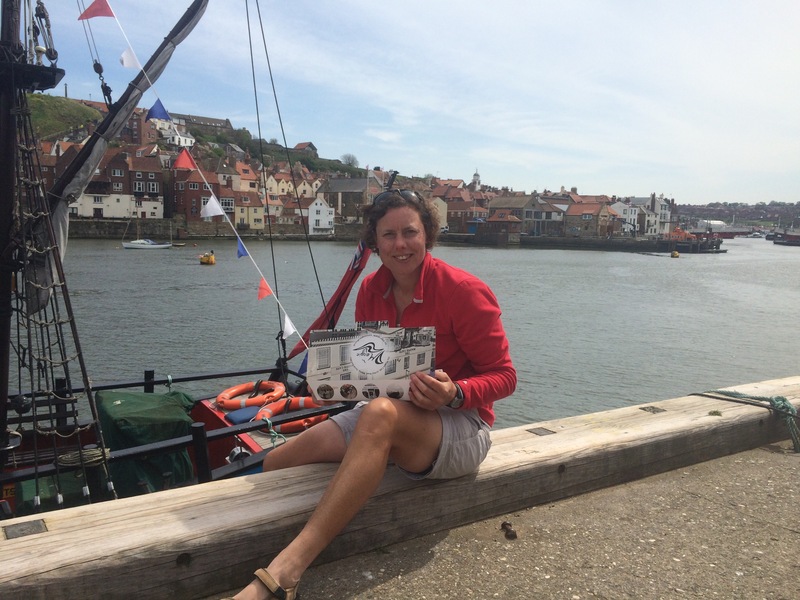 I reached Whitby in time to meet my friend, Sally, and head to Pier Road to try out some of Whitby’s famous fish and chips. There are so many fish and chip shops to choose from and we plumped for a takeaway from Magpies to eat sat on the harbour wall. Good choice. An afternoon wandering round the town followed. It’s quite a touristy town but it has a nice feel to it. 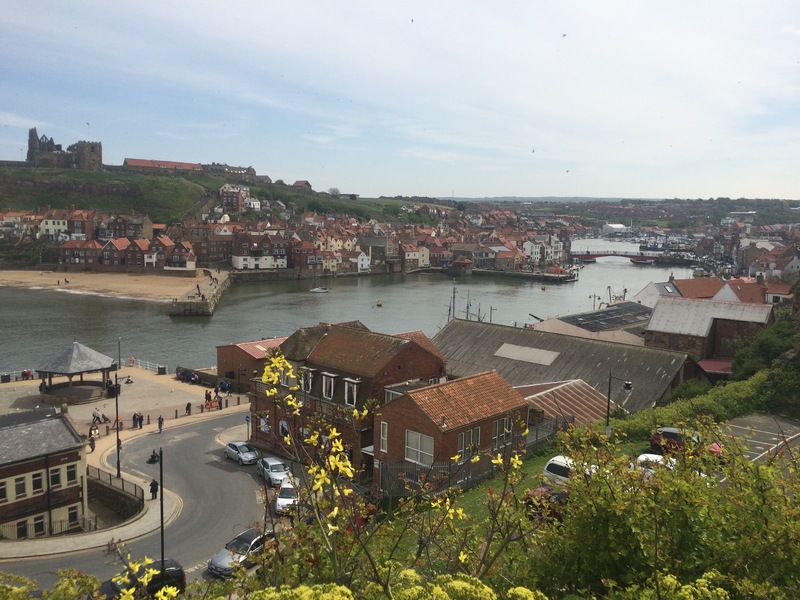 Famous for Whitby jet (I bought a small necklace as a reminder), being the home of Captain Cook, and as the place where Bram Stoker dreamt up Dracula (plenty of ghost tours and goth shops about), it was also once an important fishing port. 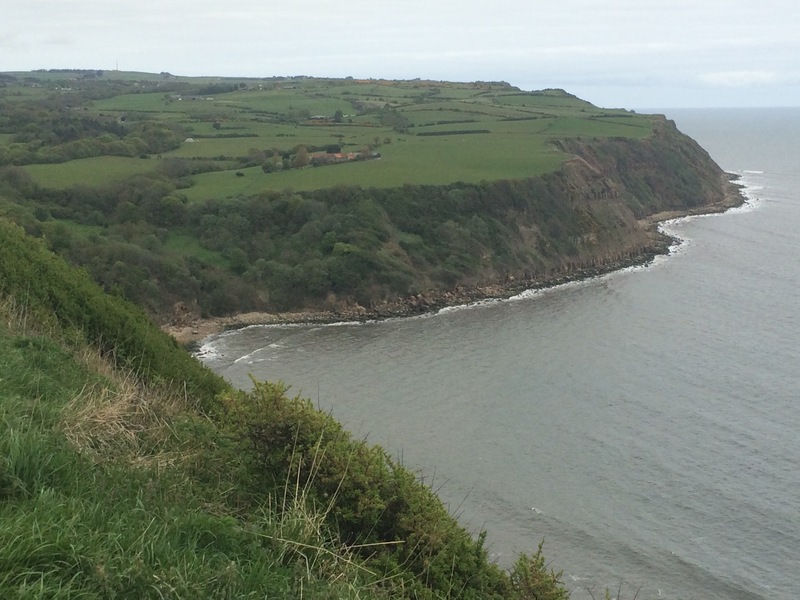 Back to Robin Hood’s Bay (in a car this time) for a weekend off to enjoy this area. So much to see and do around here. Best to start the weekend with a 99p ’99’ ice cream I think. It was nice to sleep in a proper bed and thanks to Marie for hosting me, feeding me and allowing me to do some washing. 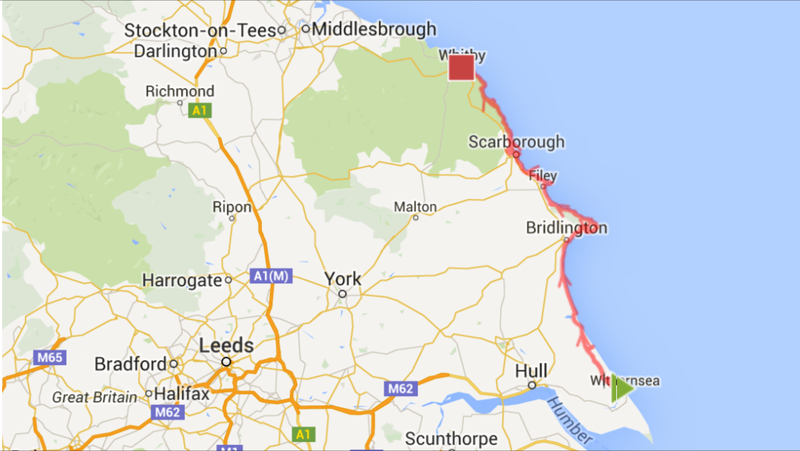 She even gave me a lift back down to the North end of Morth Bay, by the Scalby Mills Sea Life Centre. The sky was grey all day but at least it didn’t rain and the visibility was excellent again. Today felt like I was on a completely different walking trip as I entered the North Yorkshire Moors National Park at Long Nab. 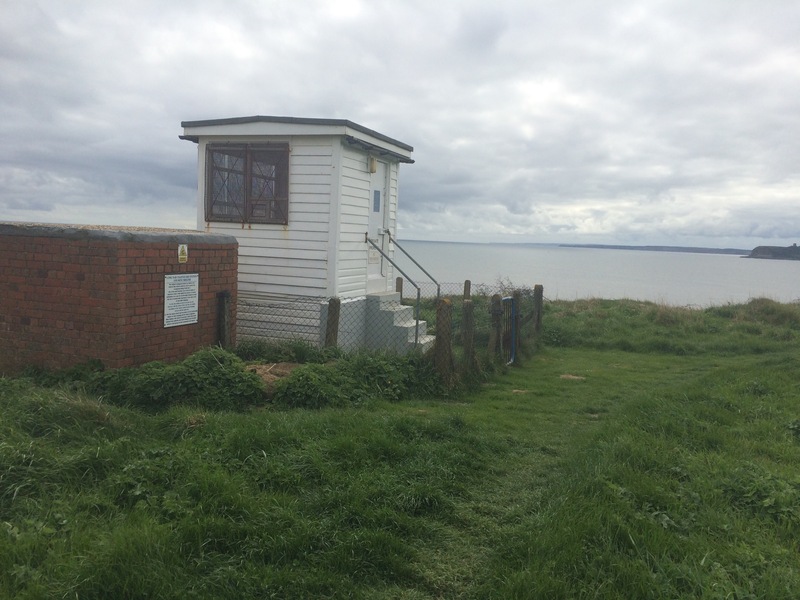 Here is a perfect spot for the old coastguard lookout station that was built in 1927. No more seaside towns in the National Park, instead I felt like I was hiking through the hills. I saw farmland, hedgerows, cows, a farmer herding sheep, cobbles in the footpath, becks and dales. And then on my right hand side I had the vast expanse of the North Sea and I could hear its constant roar. It was like walking in the Lake District at the coast; brilliant. 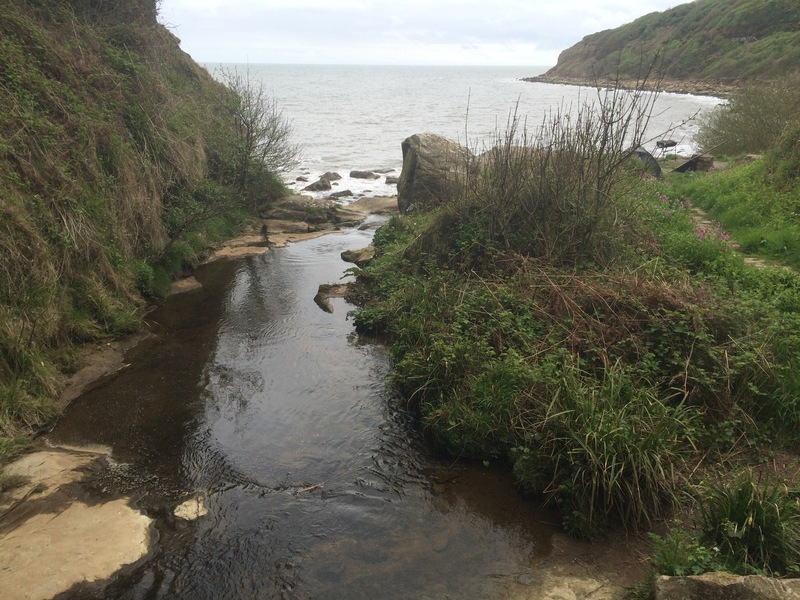 The first amazing place I came to was Hayburn Wyke, where Hayburn Beck flowed into the beach. What a magical place; somewhere to pitch your tent and have a BBQ. There was a lot of up and down on today’s walk, mostly using steps that were all really large and I was glad I had my poles to help. 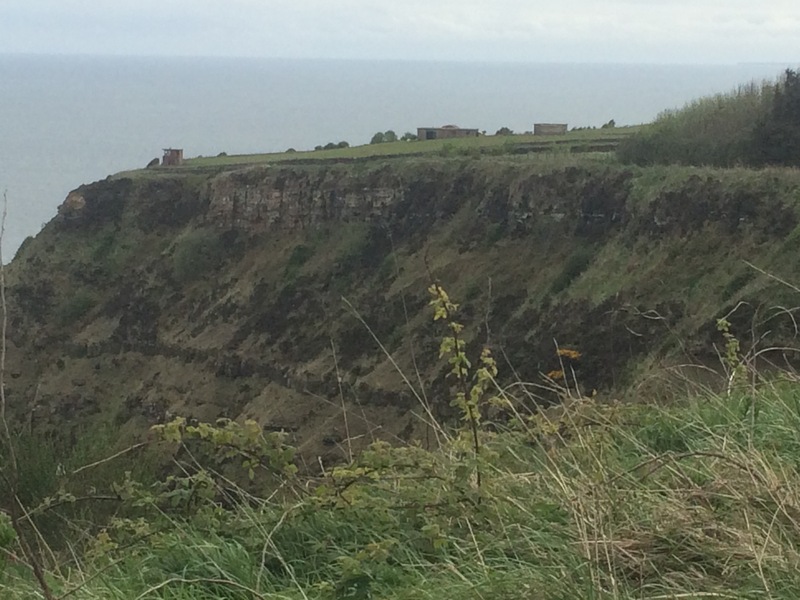 Just a bit further along the cliff was the Ravenscar radar station and lookout that was used in WW2. I reached Ravenscar in time for a late lunch at the tea rooms in the old Ravenscar Hall Hotel. You can’t beat a pot of tea served in China cups. 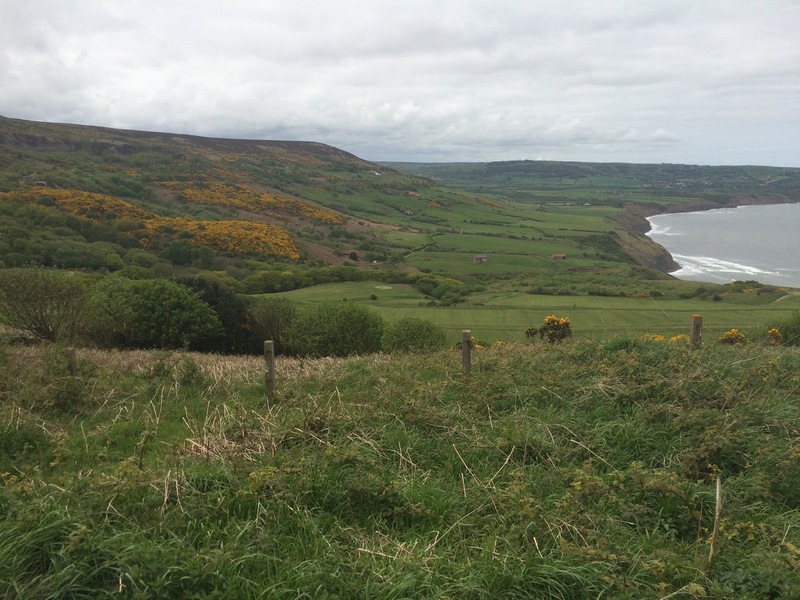 From Ravenscar it’s worth leaving the Cleveland Way and heading down to see Peak Fault. 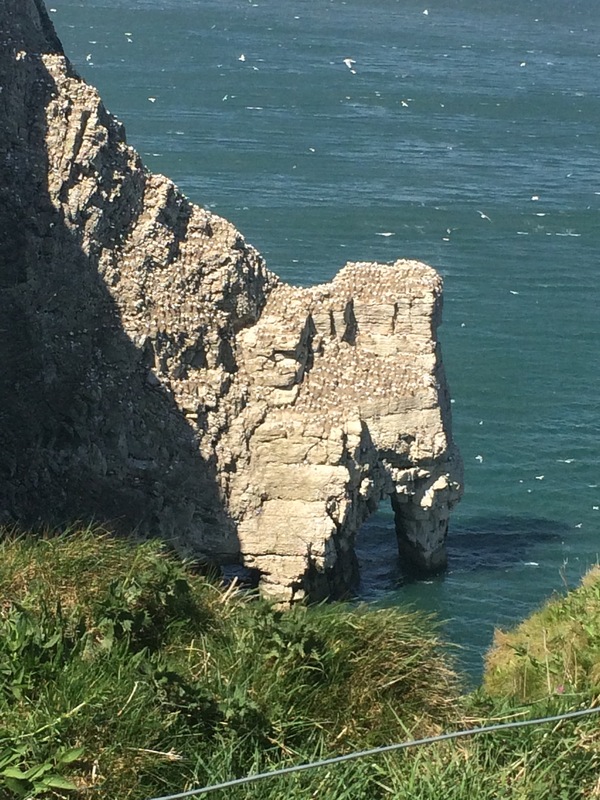 It’s a geological fault line right here in the UK that is clearly visible as a line in the rocks at low tide. Look at the cliffs and the ones on your left are completely different to the ones in your right. Amazing. The view of Robin Hood’s Bay from Ravenscar is stunning. As I walked on the cliff top around the Bay I stopped to marvel at the old Alum works. The scars of the quarry are visible in the hills and the ruins of the works on the cliff top. To extract the alum from the quarried slate one needs seaweed and human urine! Both were shipped in and hauled up the cliff in a train. 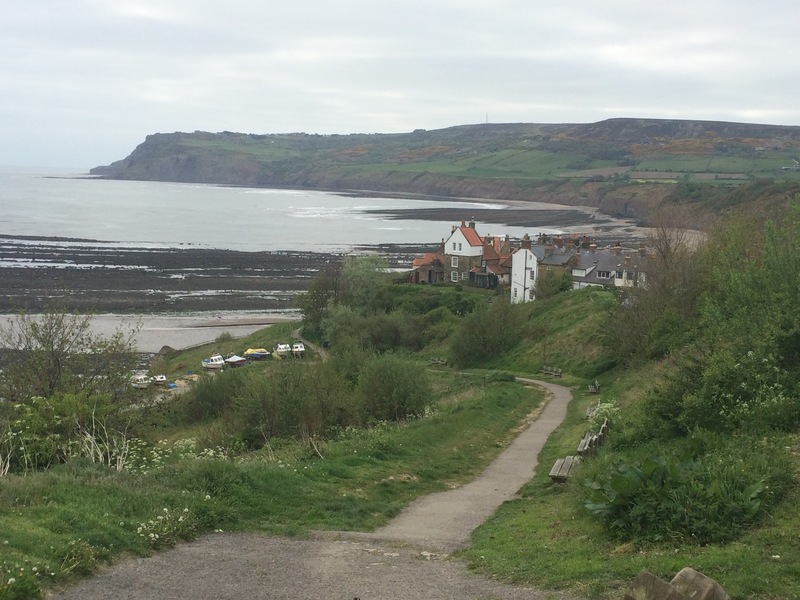 The town of Robin Hood’s Bay is quaint and has a very steep hill (30% incline). I am staying here in a cottage for the next 4 nights and taking the weekend off to explore the area a bit more. Tomorrow I get to walk to Whitby without my heavy pack. 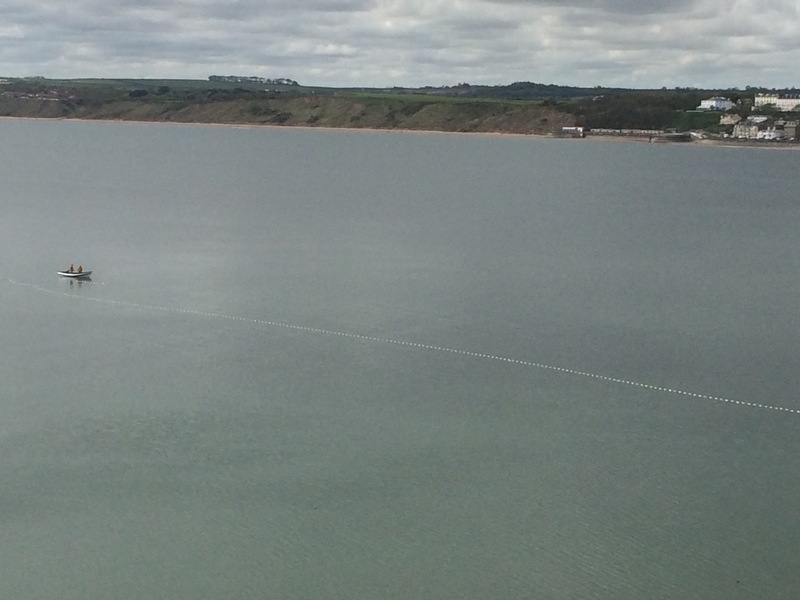 I woke to a gloriously sunny morning and a wonderful view across Filey Bay. Filey has a nice looking sea front with some lovely old buildings. 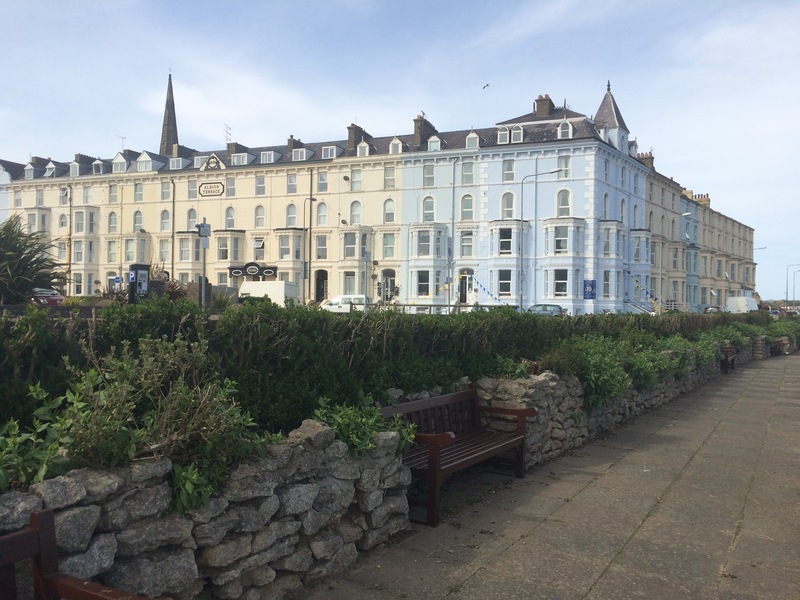 It looked quite small until I walked around the headland and saw the smaller mass of suburbia that sits behind the genteel sea front. I stopped for a coffee and a bacon and egg buttie and thought about taking a dip, then the clouds started appearing so I didn’t bother. 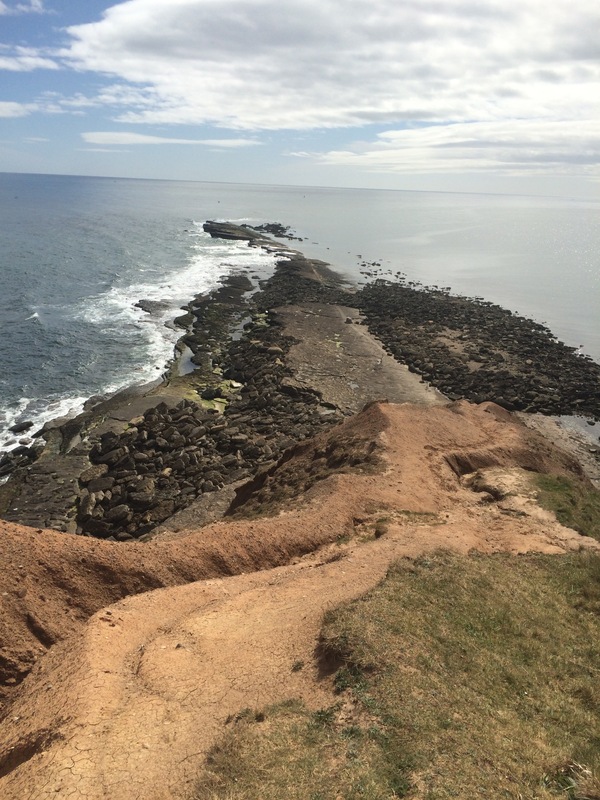 Instead I walked up the cliff and onto the Carr Naze promontary that overlooks Filey Brigg, which is essentially a bunch of rocks that get covered with the tide. Great for rock pooling at low tide apparently. Carr Naze affords great views all round, hence the Romans had a signal station here. 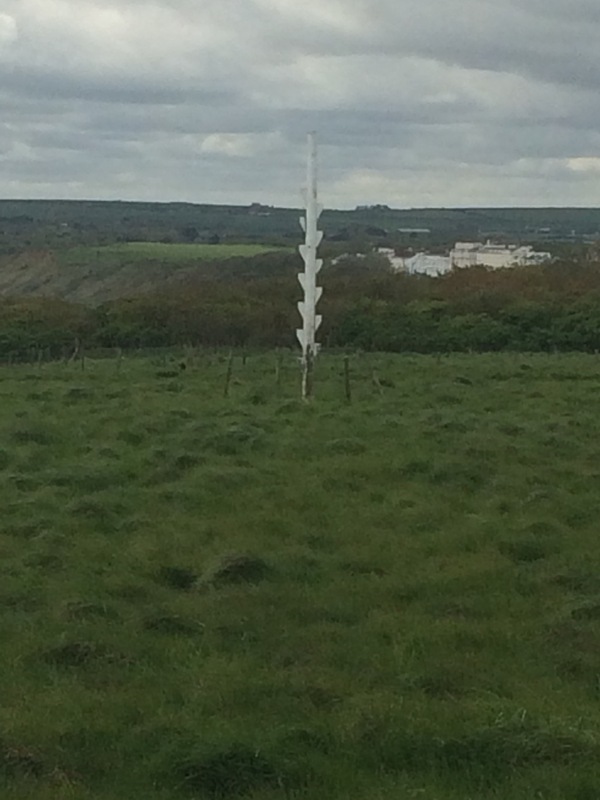 Also on the headland is a rocket pole that was put there by the Filey Volunteer Life Saving Rocket Company in 1872.
someone had to stand on the top of this pole pretending to be on a stricken cargo ship and have a rescue line rocket launched at them! 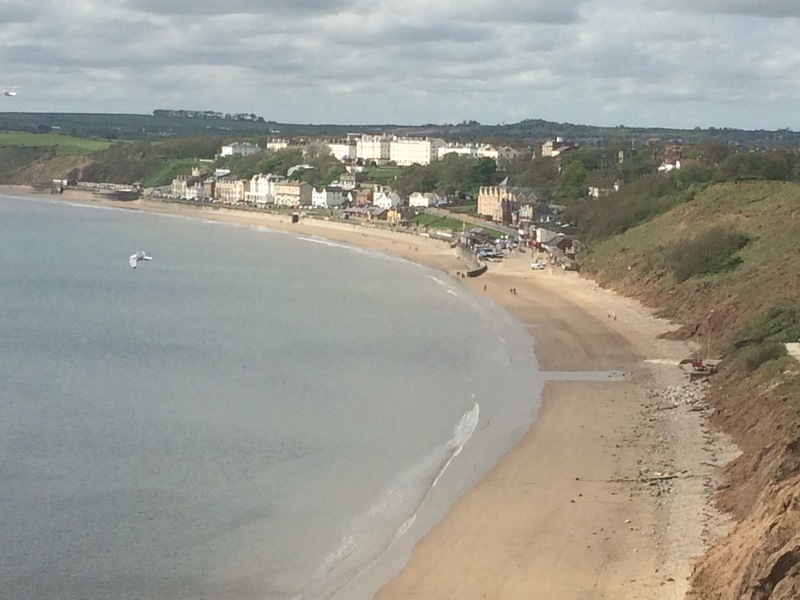 Filey is the start of the Cleveland Way long distance walk and several people asked me if I was walking it. I generally said “yes, and a bit further”. 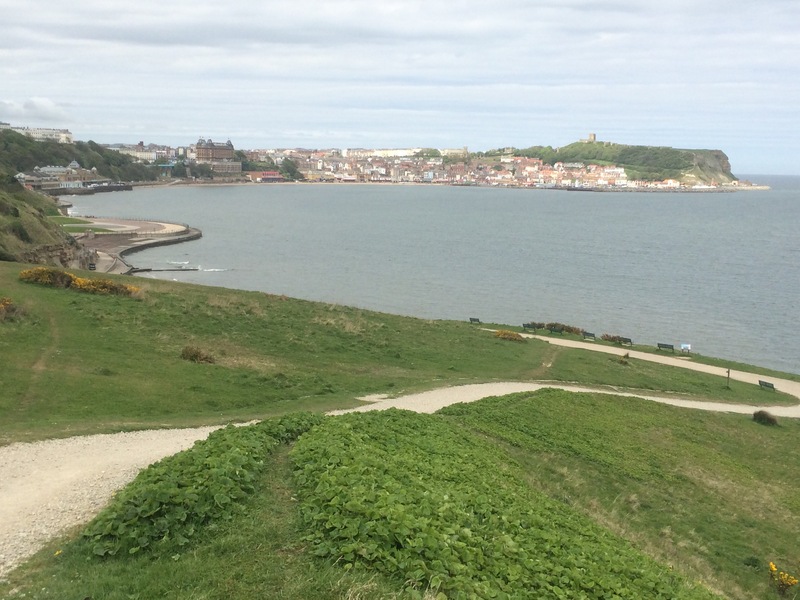 The headland walk all the way to Scarborough was lovely with great views and plenty of birds to watch. Today I saw cormorants nesting on the cliffs and kestrels, although I didn’t see any of the 4 pairs of peregrine falcons that are in the area. After Clayton Bay there were several ups and downs as the path weaved its way over the cliffs and through the woods before coming out at Scarborough’s South Bay. 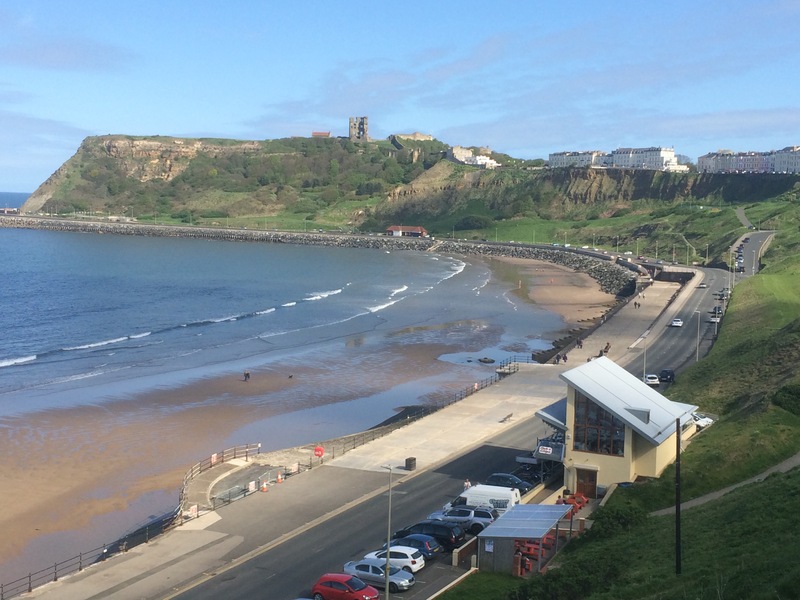 Like Filey, Scarborough looks almost regal from the front with its large and imposing buildings. The first one is the Spa theatre (there was one of those in Bridlington too) with its deckchairs and curved glass window. Then there’s the elaborate footbridge that joins the South Cliff to the main town and the Grand Hotel. All relics of Scarborough’s heyday in the 1930s. 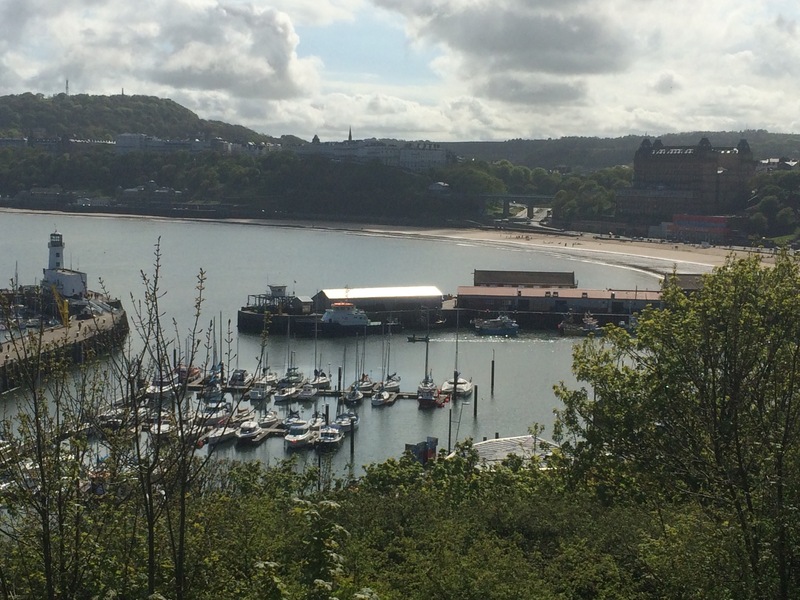 I wandered around the town taking in as many sights as possible, walked up to the castle walls for a great view of the town and over the top to North Bay. North Bay has lots of imposing guest houses (and ex-guest houses) looking down on it and the sun was out again as I walked to Marie’s house. Marie is my friend Helen’s cousin and she kindly agreed to put me up for the night. 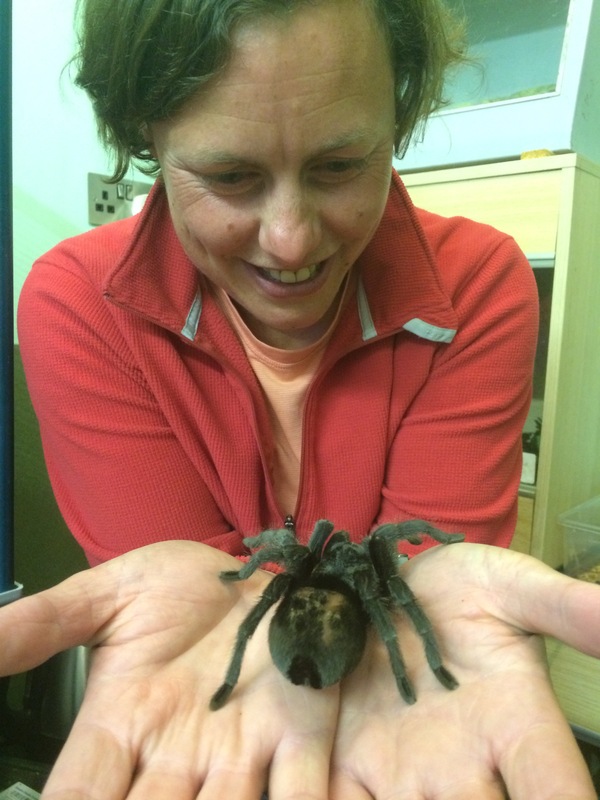 Marie is an animal workshop provider and I got a tour of her animals, the snakes, tarantulas, rat, sugar gliders, salamanders and more. Wow. What a fantastic day. It started well when I found a cafe in Flamborough village and had my first cooked breakfast in 6 days (not that I’m counting!). I also wrote a postcard to Raymond. 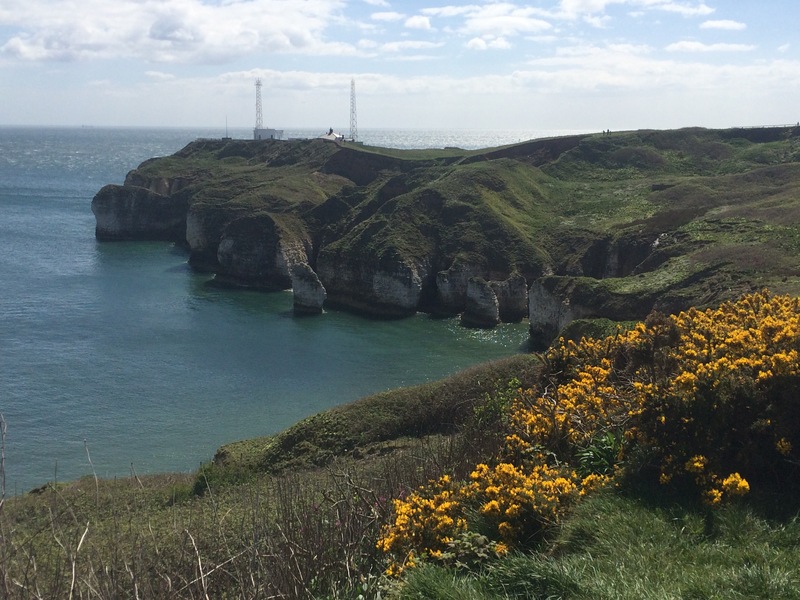 Ready to face the day I headed down to the cliffs at South Landing and began my walk around Flamborough Head. The sun came out and even though the wind was still strong it was pretty much perfect. My first proper cliffs of the trip, and they were stunning. As I got to the Head itself there was the lighthouse just inland and I could look down to Selwick’s Bay and see a line in the sea where the brown water met the deep blue. Amazing. Brown water meets blue, which side would you prefer to swim from? I carried on round the cliff, turning more into the wind, and suddenly I saw them (and heard and smelt them), hundreds of sea birds covering the cliffs. And these were only the start because the 400ft high Bempton Cliffs were yet to come. 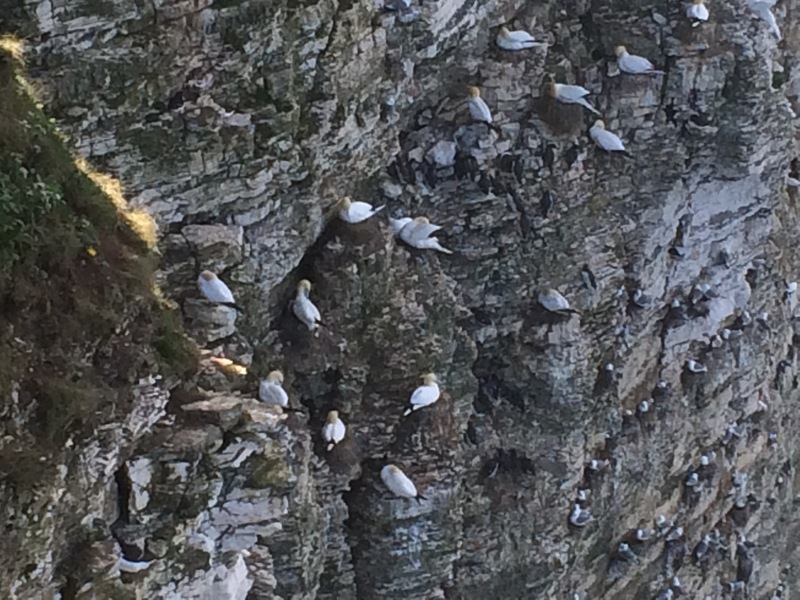 From North Landing all the way along Bempton Cliffs there were thousand of birds nesting. My timing was excellent in this regard and I got to watch gannets, guillemots, razorbills, kittiwakes and even puffins hustling for space on tiny cliff ledges and soaring on the updraughts. A phenomenal sight. It was my first sight of puffins and, next to the expert flyers like gannets, they looked like small clockwork toys with big orange feet, flapping their little wings like mad to stay in the air. I wished I had my binoculars but a kind man loaned me his so I could get a closer view of all these wonderful birds. 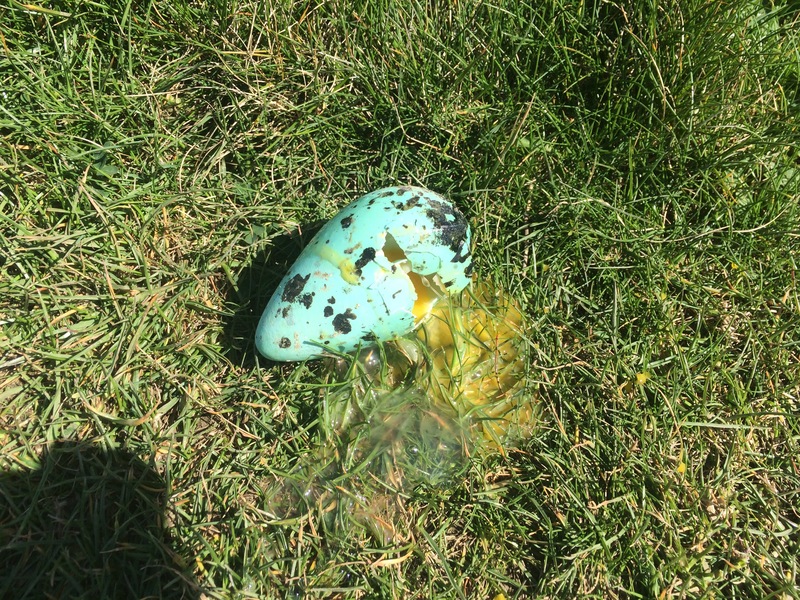 I even saw a guillemot egg that had been dropped on the footpath. 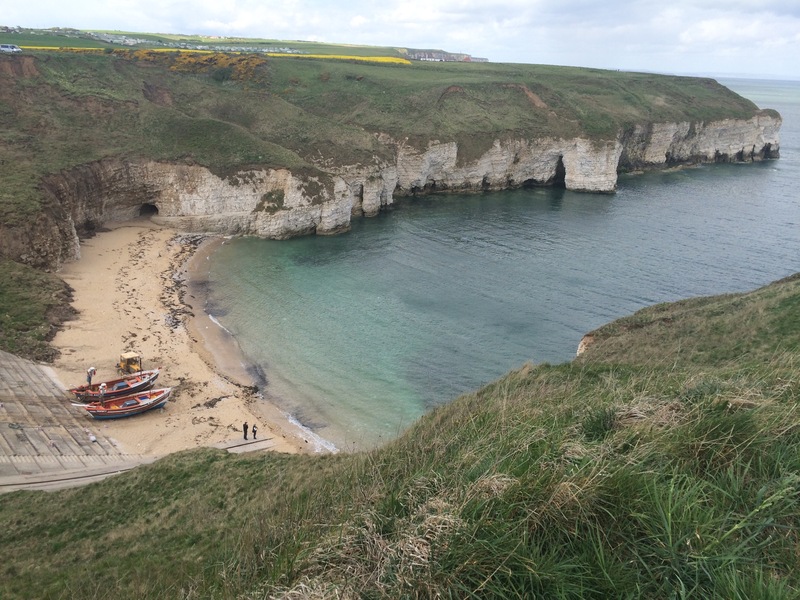 On the North side of Flamborough Head the 2 tiny bays of North Landing and Thornwick Bay have beautiful blue water contrasting with the chalky cliffs and they are full of caves that need to be explored from the sea. 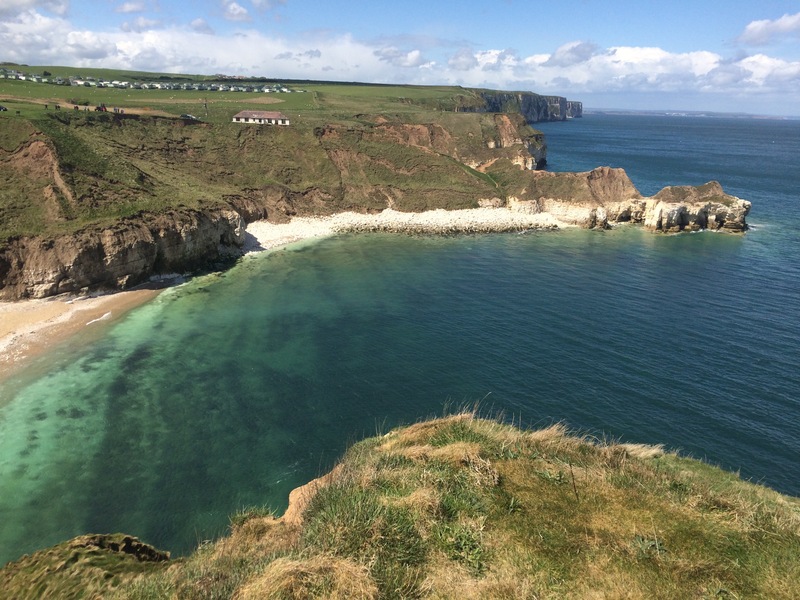 Thornwick Bay with Bempton Cliffs in the background – look at the colour of the sea! Unsurprisingly, Bempton Cliffs is an RSPB reserve and so, just when I thought things couldn’t get any better, I saw a sign for the RSPB cafe. Time to stop for a coffee, check of the puffin activity on the webcam and chat to the friendly helpers. 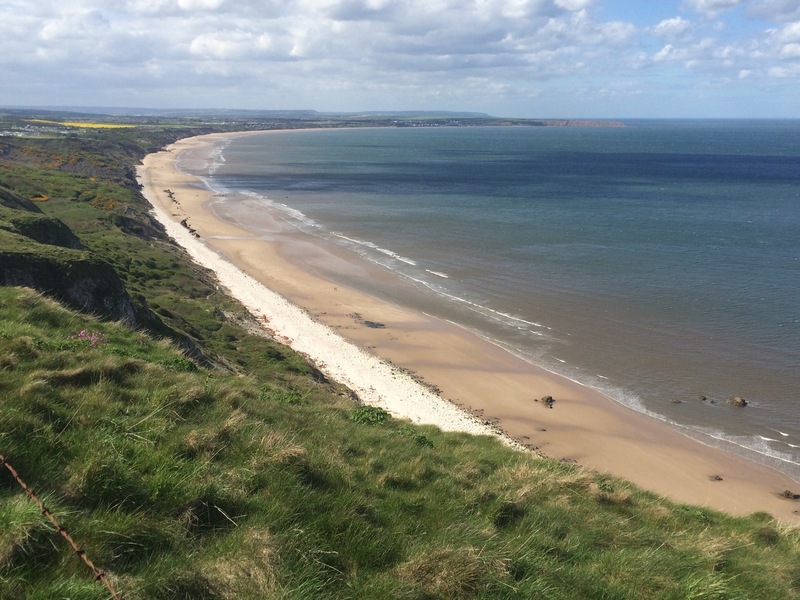 To finish this amazing day I walked down off the cliffs, leaving East Riding and entering North Yorkshire, onto Speeton Sands at the Southern end of Filey Bay. What a view across the bay. The wind was getting stronger and I was getting sand blasted on the beach but I didn’t care. 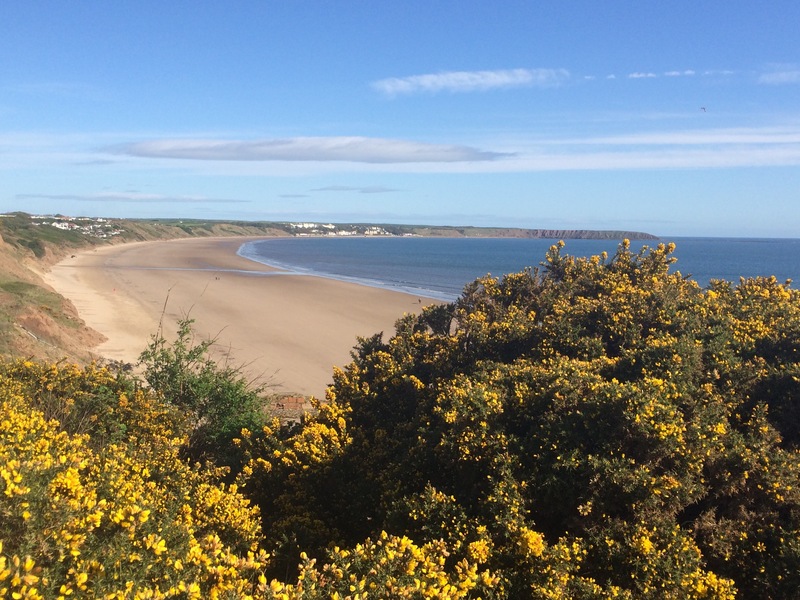 This stretch of beach is where the only remains of an amphibious dinosaur were found a few years ago and I met a couple of dinosaur hunters looking for more in the special soft blue-coloured clay. 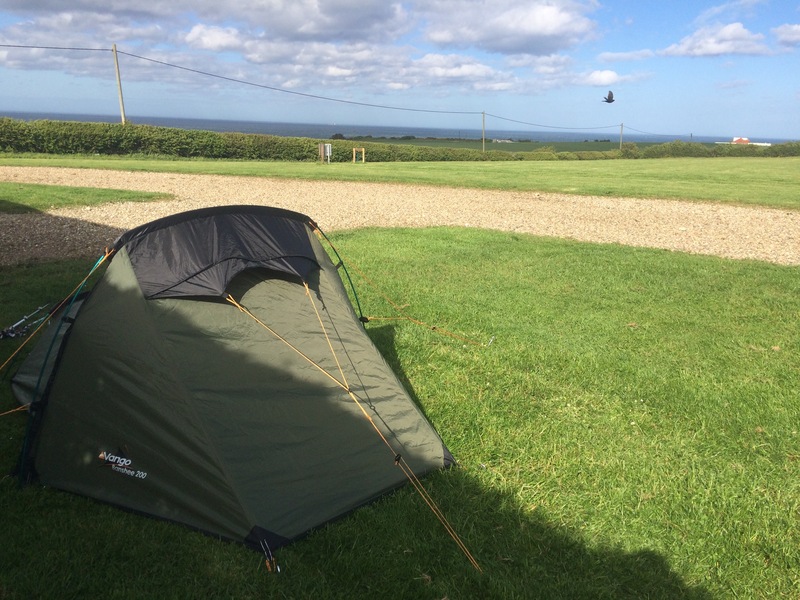 I walked back up the hill to my campsite and managed to pitch my tent behind a big hedge out of the worst of the wind. I had to walk a mile to the nearest pub but it was worth it for decent fish and chips, a pint, wifi and a plug socket for my phone (the last 2 being essentials these days). 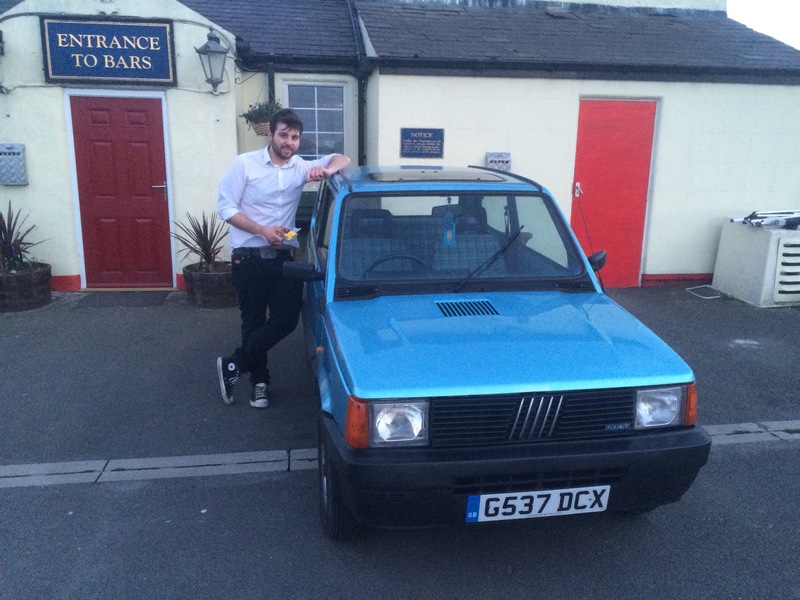 Luckily I didn’t have to walk back as the barman gave me a lift in his Fiat Panda 4×4. Holderness is so called after the Nordic noble families (holders) who owned the nose-shaped land (ness) of the area around Spurn. From the beaches this coast looks just like Norfolk with its crumbling and eroding soft clay cliffs (housing lots of sand martins). In fact I think the scale of the erosion is worse here, there are certainly more documented lost villages and today I saw part of a road that’s marked on my map but no longer present. the minor road from Ulrome to Skipsea is no longer! 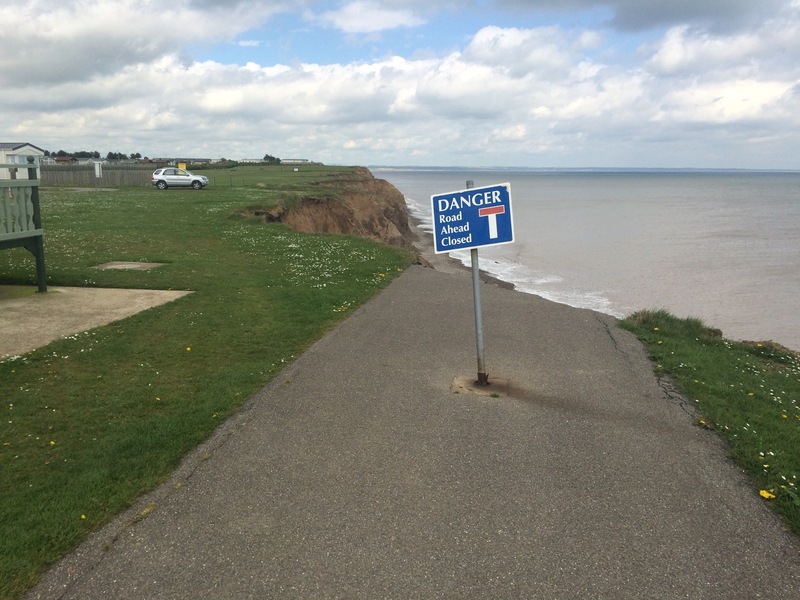 As a result of the significant recent erosion there are no longer cliff top paths along much of this coast, hence in order to get to Hornsea I had 3 choices: a) walk on the beach (tide dependent so I would need to start at approximately 3am to make it today), b) walk along the minor roads facing the oncoming traffic, or c) get the bus along the same minor roads. Option c won the day and I’m considering starting every week with a bus ride as they’re great. I was ready in plenty of time to walk back into Withernsea, past the lighthouse, to catch the bus, and it was a double decker; the front seat at the top had my name on it. It was a nice ride through the farmland and a different view of the coastline. I stopped for a quick coffee and breakfast in Hornsea, which seemed to still be sleeping even though it was 10am. From here there was a cliff path most of the way to Bridlington, with some diversions through the inevitable caravan parks in places where the erosion had claimed the path. In fact there were many dead end roads heading off the cliffs and lots of spaces where caravans had once been. Thank goodness they closed that road to the beach! 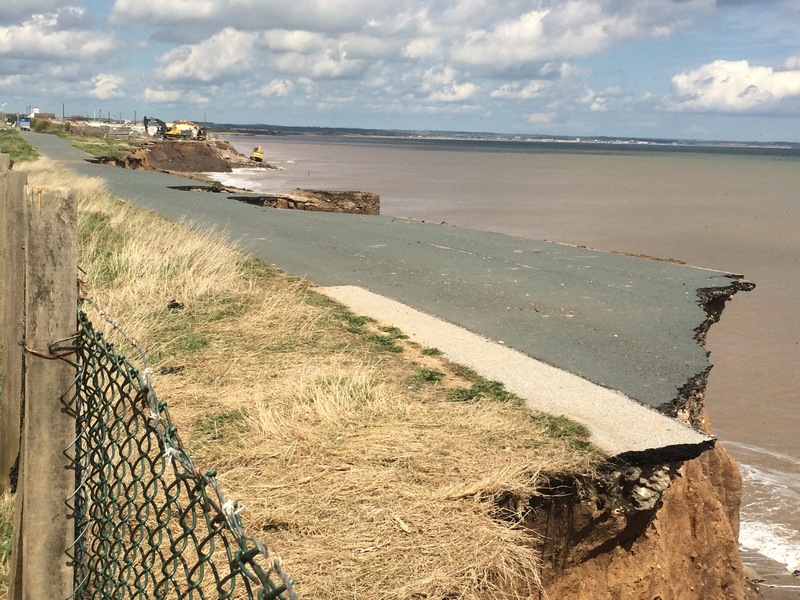 In Ulrome the workmen were out demolishing the damaged sea wall, so the caravan site there now has a death sentence. It was quite sad really. 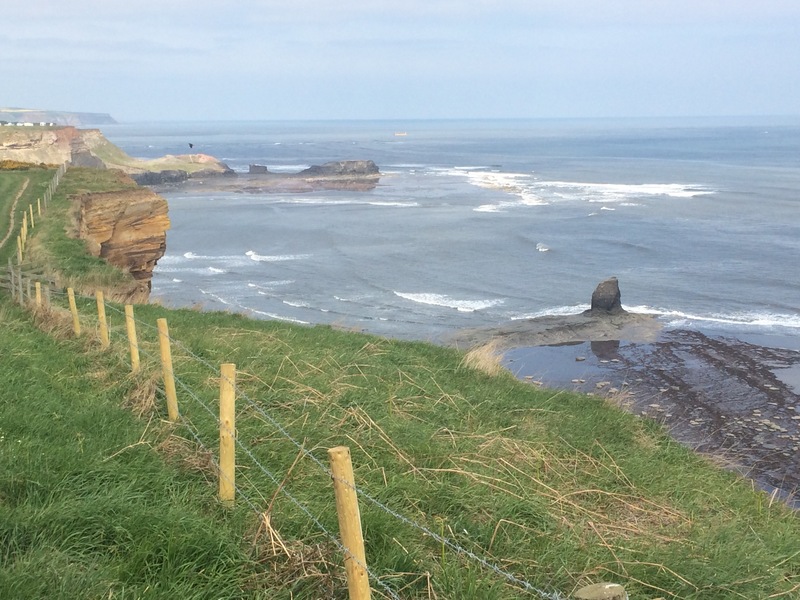 Eventually I reached a point where grumpy landowners had fixed fences to the cliff edge, along with no entry signs, so I was consigned to the beach. Fortunately the tide was heading out and there was enough beach for me to walk on. Fraisthorpe sands, just South of Bridlington, is a lovely beach and it was perfect sunny weather to enjoy it. I stopped short of a swim as the water is still an uninviting muddy brown colour until about 50m offshore, where it turns greeny-blue. It was here that I saw my first nudist of my walk; I wish I hadn’t! I liked Bridlington. At one point I thought maybe it was the Brighton of the North? Approaching from the South I reached the lovely big houses first, then the South promenade (done up in the late 1990s) and the town centre. 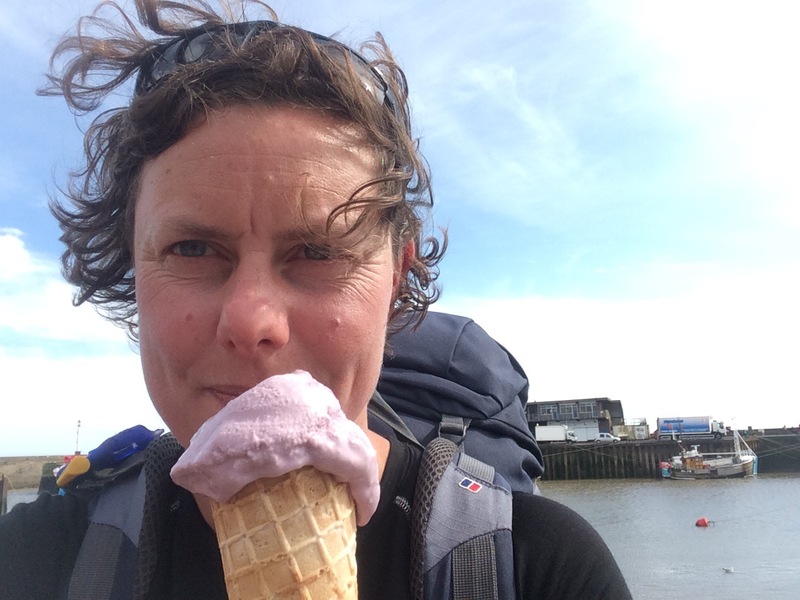 Time to stop at a cafe and also to enjoy an ice cream in the sunshine. 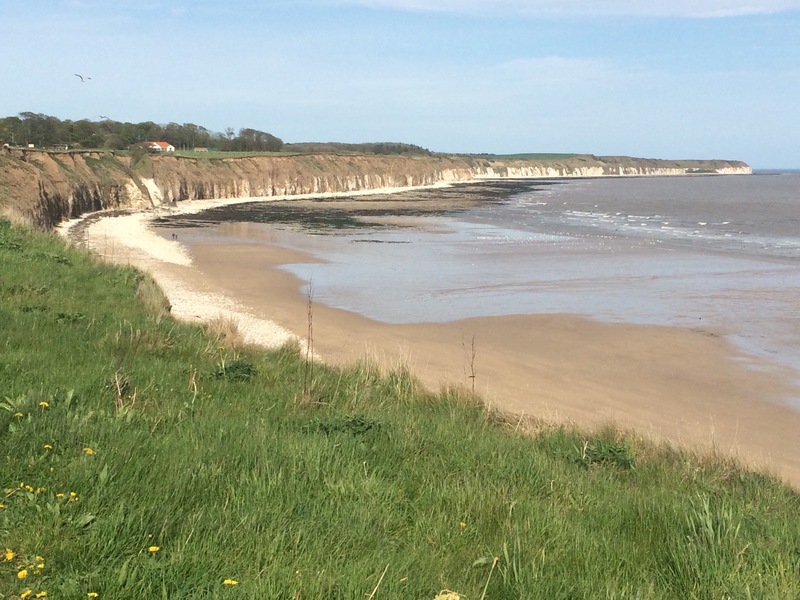 I exited Bridlington up a hill onto my first real, and very beautiful, cliffs of this walk. 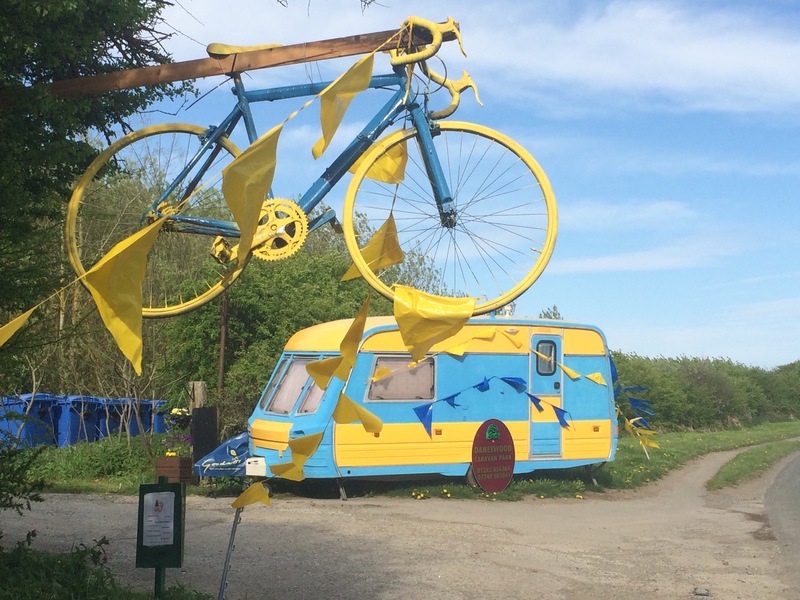 I was heading past Sewerby and on to Flamborough. 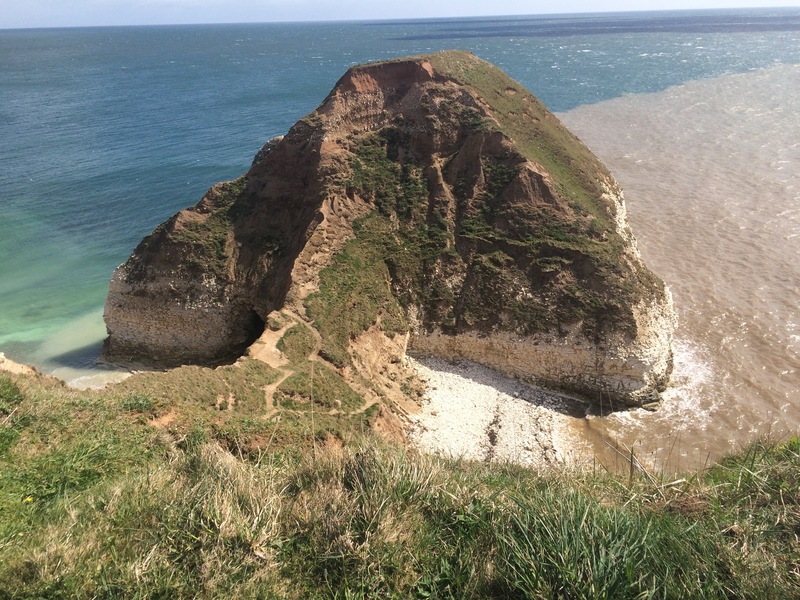 My walk finished with a lovely trek up a wooded valley following Danes Dyke, which bisects Flamborough Head. A great day.